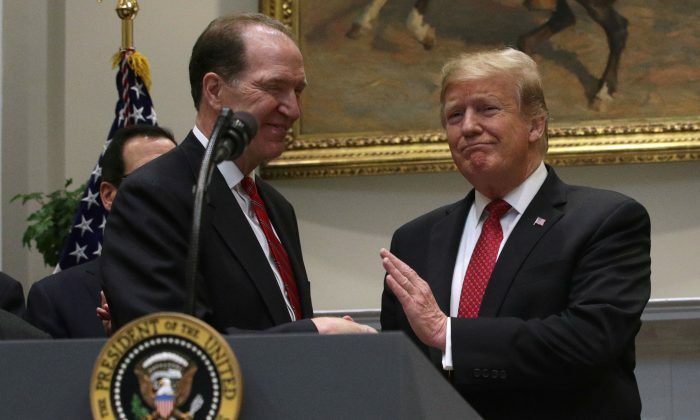 David Malpass, President Donald Trump’s nominee for the position of World Bank president, said he intends to implement reforms that he helped convince the international institution to accept. Currently the Treasury’s undersecretary for international finance, Malpass is responsible for maintaining relations with nearly 100 international organizations and working groups. Together with Treasury Secretary Steven Mnuchin, Malpass made it his priority to get the World Bank to accept a number of reforms, including an increased focus on helping poorer countries and reducing lending to richer countries. The Trump administration also has secured a $13 billion funding increase for the bank. “There’s a great opportunity now to implement these constructive reforms that will lead to faster growth and greater prosperity,” Malpass said. The World Bank serves to lend and grant money to poor countries for development projects, as well as help the countries set up institutions to reduce poverty. The organization is owned by its nearly 200 member countries, but the United States holds a controlling stake of about 16 percent, which includes veto power. The member countries give the World Bank initial capital that it then leverages to borrow more money, which the bank then lends under favorable terms to countries that would otherwise have trouble getting a loan. If the investment falls through, the member countries are on the hook to cover the losses exceeding the bank’s capital. However, in practice, the bank has been lending to a number of middle-income countries. One of the largest recipients of World Bank capital has been China, which not only has ready access to capital markets but also runs an international development project of its own—the One Belt, One Road initiative. “It doesn’t make sense to have money borrowed in the U.S., using the U.S. government guarantee, going into lending in China,” Malpass said in November 2017 during a Council on Foreign Relations event. China currently owes the bank over $16 billion, a debt surpassed only by those of Brazil, Indonesia, and India. Thanks to pressure from the Trump administration, the bank has now “committed to directing a bigger share of its lending to poorer countries,” Malpass said in his Dec. 12 congressional testimony. The bank also agreed to work on “graduating”—gradually cutting off—countries that should be able to manage on their own. The reforms also aim to increase transparency on the bank’s lending and constrain the growth of bank staff salaries, which is the largest part of its $4 billion administrative costs. The various boards of the World Bank alone cost nearly $150 million in 2018 (pdf). To become president, Malpass still needs to win the approval of the World Bank’s 12-member executive board. The United States has traditionally chosen the World Bank’s leader, and though challengers could emerge, it’s likely that Trump will get Malpass in. A source from the bank’s board has said that there was little appetite among member countries to mount a challenge to a U.S. candidate who is seen as qualified and reasonable. If approved, Malpass would replace physician and former university president Jim Yong Kim in the role. Kim, first nominated by former President Barack Obama in 2012, stepped down on Feb. 1 to join the private equity fund Global Infrastructure Partners more than three years before his term ended, amid differences with the Trump administration over climate change and development resources. Malpass stands behind Trump’s opposition to globalism in its current form. Malpass would likely steer the World Bank more toward U.S. interests under Trump’s “Make America Great Again” policies, and away, in particular, from Chinese interests under Chinese Community Party rule—in stark contrast to Kim’s leadership. The World Bank will accept nominations from Feb. 7 through March 14, and up to three candidates could advance to a board vote. Malpass, 62, was an economic adviser to Trump during his 2016 election campaign. He served as chief economist at the investment bank Bear Stearns and Co. prior to its 2008 collapse and served at the Treasury and State departments under Presidents Ronald Reagan and George H.W. Bush. Centralized banks were supposed to end the financial cycles of boom and bust, but instead amplified it. We explore the FederalReserve, state banks, the abandonment of the gold standard, and the financial cycles of debt and irresponsible lending. The World Bank's two top executives, including the CFO, are stepping down according to a leaked internal memo. The World Bank is reducing its forecast for the global economy this year—again.